The Ball Minnow Trap The Ball minnow traps were all made by Ball Bros. - Okmulgee, Oklahoma around 1960. There were about 1000 of them made. 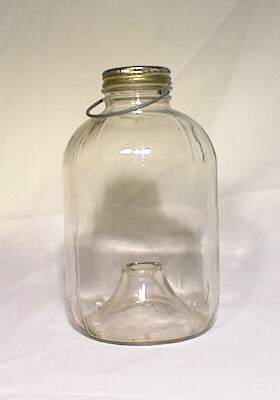 All were clear gallon glass jars with the regular 2-piece Ball Mason canning lid with five holes punched in it. There are some mason jar traps with the larger opening, like a mayonnaise jar, and I think these were made by glass factory employees for personal use. The Ball trap has a wire bail attached to the neck through indentations in the glass.